Bob has been one of the volunteer FST workforce given the chance to move into employment as part of this inspiring prototype, which was launched last year. 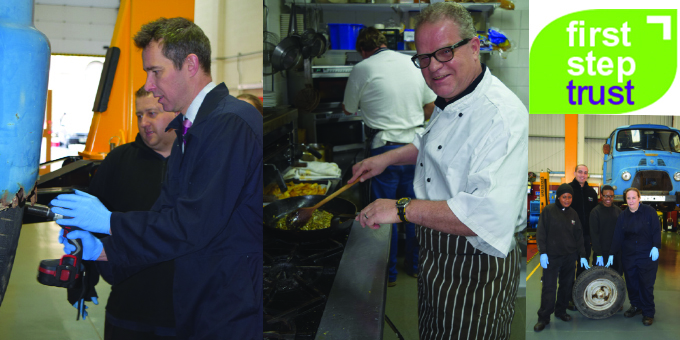 It offered senior executives the opportunity to ‘trade places’ with a member of FST’s workforce for a few hours, either at its Abbeyvilles’ restaurant in Clapham or at its garages in West Norwood or Woolwich. The executive was able to reciprocate with an opportunity for one of FST’s workers to either shadow them for a day or spend some time at their workplace. • senior executives met people with mental health problems and other disadvantages on an equal footing – everyone was there to do a job of work. • this has helped to dispel some of the myths about mental illness that lead to stigma and disadvantage in the workplace. • the experience has benefited FST workers and help them to gain the confidence to move on into paid work. it is hoped it has encouraged senior executives to consider partnerships with social enterprises, such as FST, when letting or bidding for work contracts. There is overwhelming evidence that employment in a healthy work environment is good for people. It provides meaning and structure to a person’s day and creates a sense of being part of society and of a wider community. This applies equally to people, who because of mental health problems, are unable to hold down a job with a mainstream employer either temporarily or longer-term. The provision of work for people with mental health problems has wider benefits by reducing people’s dependency on health and social care services, reducing dependency on welfare benefits and reduction in poverty. Watch this space for more information on how Trading Places may be extended. Click here for the January update. Click here to see how MP Helen Hayes and others fared in February.